Neither of us could remember where we bought the millet from… but there it was in the cupboard when we were searching for inspiration for tomorrow’s work lunch! Tiny button mushrooms are on offer at Aldi this week, along with green beans, and there’s still more tarragon to use up so a quick pickle seemed a good idea. It always perks up this sort of salad up nicely! Tarragon and allspice may be an unusual combination, but the scents of the two together worked together well, and happily, so do the flavours. 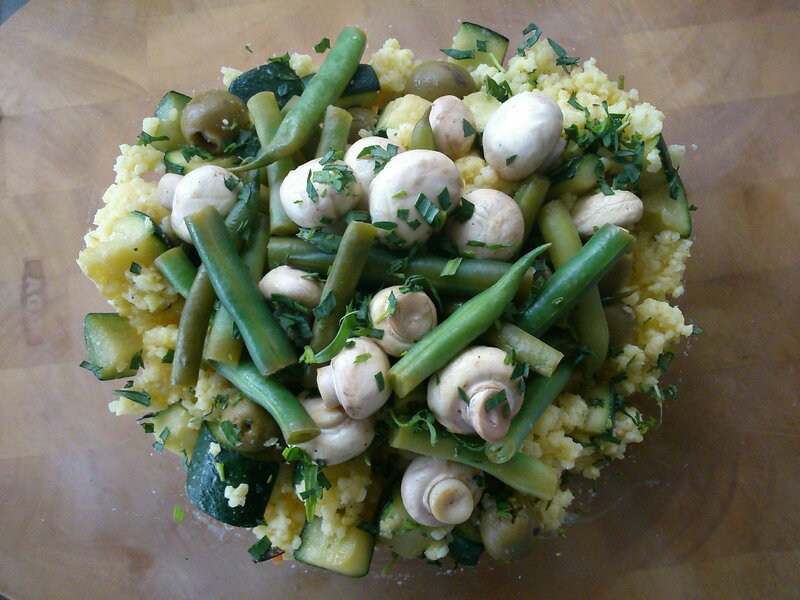 Along with stir fried courgettes for the almost creamy flavour they get when they start to caramelise, and olives for a salty hit, its a great salad full of interesting textures and flavours. Firstly cook the millet in the stock. The type we bought came in bags of 100 g each, and the pack instructions were to simmer it for 15 minutes in the bag, which worked well. Leave the millet to cool. Put the vinegar into a small saucepan. Crush the tarragon with your hands and add it to the pan with the allspice and a pinch of salt. Heat for a few minutes until the vinegar is just starting to simmer. Add the mushrooms and green beans, stir to coat and cover the pan. Turn off the heat and leave to steep for 20 minutes. Heat the oil in a medium saucepan or wok and stir fry the courgette for a few minutes until lightly browned and tender. Mix the courgettes and olives with the millet (you will need to break the millet up a bit, it will have stuck together as it cooled). Drain the pickled vegetables, and serve them on top, sprinkled with the tarragon.